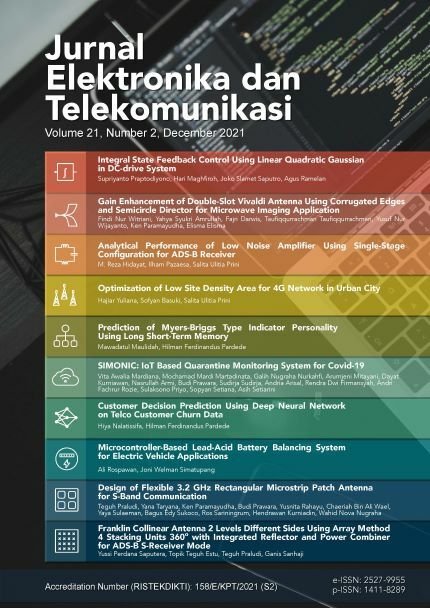 Jurnal Elektronika dan Telekomunikasi (JET) is an open access, a peer-reviewed journal published by Research Center for Electronics and Telecommunication - Indonesian Institute of Sciences. We publish original research papers, review articles and case studies on the latest research and developments in the field of electronics, telecommunications, and microelectronics engineering. JET is published twice a year and uses double-blind peer review. It was first published in 2001. Online submission and publishing system using OJS has been adopted since Issue 1, Vol. 16, 2016. Starting Issue 2, Vol. 17, 2017, Submitted papers should be written in English. All submitted articles should report original, previously unpublished research results, experimental or theoretical that are not published and under consideration for publication elsewhere. The publication of submitted manuscripts is subject to peer review, and both general and technical aspects of the submitted paper are reviewed before publication. Manuscripts should follow the style of the journal and are subject to both review and editing. Submissions should be made online via JET submission site: jurnalet.com. Accepted papers will be available on line and will not be charged a publication fee. Jurnal Elektronika dan Telekomunikasi (JET) calls Scholars, Academicians, Researchers, Engineers, and Industrial professionals to submit their unpublished original work, covering topics in Electronics, Telecommunication, and Microelectronics.